In the comfort of your own home the teacher will come to you, SO YOU CAN LEARN HOW TO GROOM YOUR OWN DOG and spend as much time as it takes although each lesson is 1 hour if you go over your time don’t stress there is no extra charge you will pay a one time fee to learn over 4 months the teacher will come and see you once a month dates and time will be set however we can change the times just in case something urgent comes up. You will learn what you need to know about the grooming of your own dog the course is not a Qualification or to certificate level. Grooming your own dog has great advantages of bonding building trust and learning about their general health sometimes we can heal our dogs without going to the vet clinic then there are times we know we need to see the vet. You will save yourself a lot of money over time by grooming your own dog you can be as creative as you want and with practice your dog will look like they just walked out of the salon. Some pets perform and try you of what they can get away with so buy learning how your dog is going to behave training you and your dog that grooming time is not playtime and the reward afterwards is playtime treats or you can choose the reward. Time is a big factor we all have our moments of I will do it tomorrow as a routine for you and your dog to get into will make life easier I have heard people say I don’t have time then why do you have a dog ? People think grooming is hard especially for the dogs who need ongoing maintenance however going to the groomers with a dog that has not had any attention in grooming takes up the groomers time and it’s not always easy for the groomer. They don’t always have the time to take knots out matted hair usually they will call you and say I am sorry we had to clip your dog shorter due to the matted hair. The groomers know when there has been no attention to the maintenance in between grooms so that’s why some dogs get the short clip all over body clip so when you come back in 4-6 weeks they know it’s just regrowth to trim and maybe a few knots on the ears or tail. 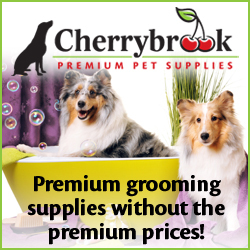 On a regular basis brushing or a comb for 10 minutes a day bathing once a week or when required clipping every 4 weeks bath dry brush trim or clip about half an hour to an hour and this will keep your dog in a well maintained and healthy condition. You will have a lot of questions so write them down as they come up and don’t worry if you make mistakes it’s all part of learning and the hair will grow back. you will be taught how to avoid accidents. for the dogs that don’t need clipping or have a longer coat there’s some easy techniques and some really good tools on the market for every dog. This post may not apply to you if you live outside of Australia and I may have given away my ideas to the salon groomer who wants a change or to add an extra income for themselves this is the whole idea of sharing knowledge ideas and building relationships between people and their pets.